Are you putting together a knight, castle and dragon themed bedroom for a child? Lots of knight bedroom ideas here. I'm Mom to two boys who love knights, castles and dragons. They're big fans of Mike the Knight and renaissance fairs and historical reenactments. You can get some very cool knight themed bedroom furniture, bedding and decorations. 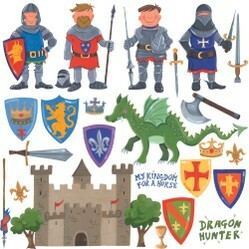 Medieval knights makes a great theme which is great for kids imagination - they can head of on dragon hunting adventures! And also a fun way to introduce a bit of history about knights and castles and jousting tournaments. 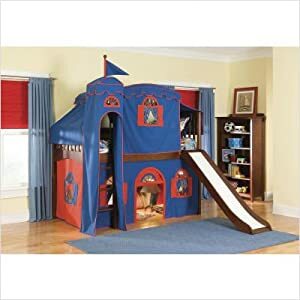 This blue and red castle bed is amazing! My older son's favorite colors are red and blue. A loft bed is a practical option and it gives you lots of storage space. The medieval castle tent makes it lots of fun too. There's even an option with a slide! This is an excellent bed for a young knight in training! View a similar bed at Wayfair. Also check for castle beds on eBay. 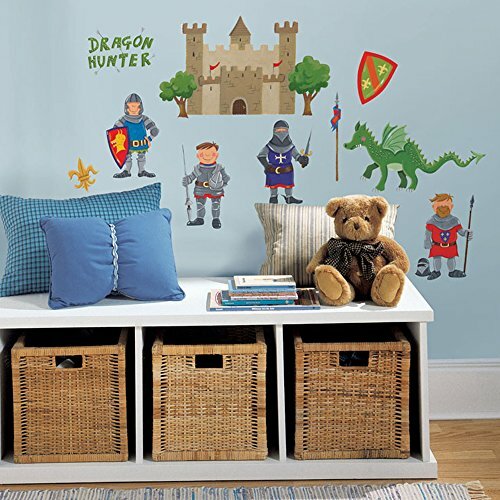 These Dragon Hunter wall stickers are a quick and easy way to give a bedroom a medieval theme. They feature dragon hunter knights, a castle, the dragon (of course!) and lots of shields, weapons and other knightly things. The stickers are repositionable and removable so you can change things around if you want to. It's not easy to find good bedding for a knight-themed bedroom. One option is the gorgeous Disney Kingdom Dragons bedding range which features lots of medieval imagery including coats of arms and dragons. 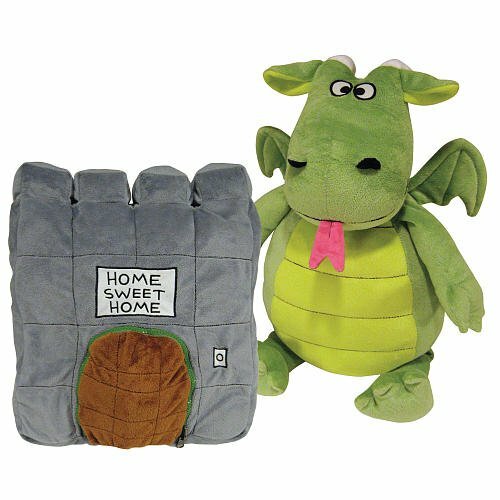 A lovely finishing touch for a knight-themed bedroom is the lovely Happy Nappers Dragon. 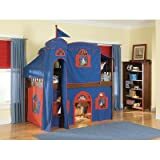 This is a plush castle with a plush dragon inside. You can take the dragon out to play. Don't worry he is friendly! And then pop him back in to make a nice soft pillow. The set even has a doorbell which you can press for the dragon's sleepy sounds. This is the Welsh red dragon flag. I'm writing this page on March 1st, St David's Day. St David is the patron saint of Wales. My children have grandparents who live in Wales so there are lots of welsh dragon flags around our house. 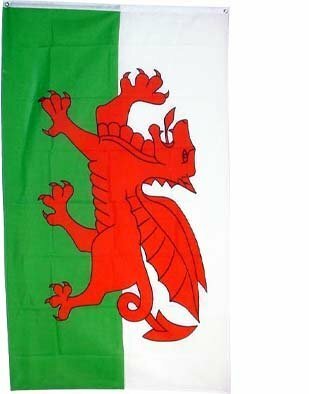 The Welsh dragon flag looks amazing in a kids bedroom with it's bright colors. A selection of my favorite knight and dragon party supplies for a fun medieval kids party. These work well if you have boys coming to a knights and princesses party too. Dragon toys are very popular with kids who love the stories and legends of knights and castles. Let's look at some of the best toys for kids who love dragons. A selection of the best knight costumes for kids for Halloween or role play. Perfect for fighting dragons and or protecting a castle. Do you know someone who would like a Knight Bedroom? Love that castle bed with slide - that looks great fun! Children's alarm clocks are not only fun, but an important tool for children. Decorate your child's bedroom with colorful Dr Seuss wall stickers or inspirational Dr Seuss quotes.